We finally did it. We earned our black belts! See? There we are – Phil, Renshi Colahan, me and Peterbilt (Paul). Woo WOO!! Look at us! Aside from “Congratulations,” the thing I heard most after my test was, “Now what?” People wanted to know if I was finished. Would I return to karate? Was there anything left to accomplish? Well, as it turns out, there’s a LOT more to learn! Our system trains in three different martial arts. 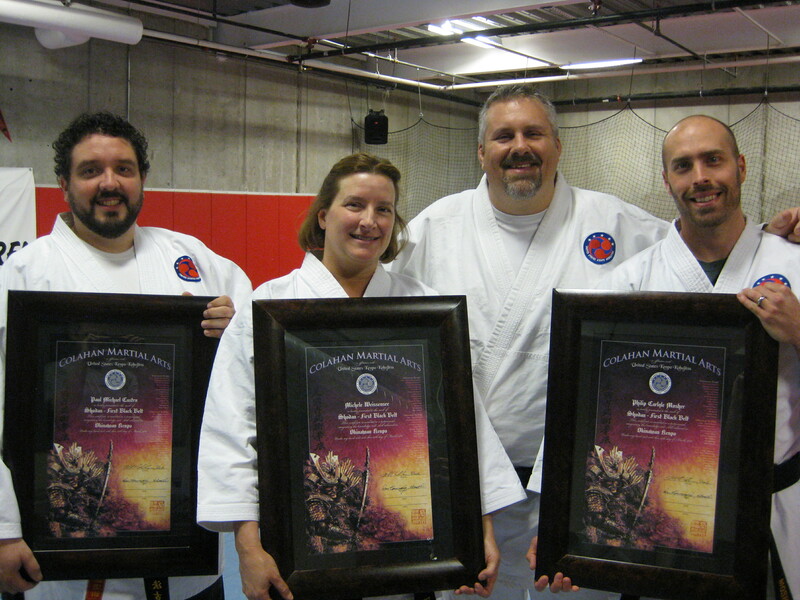 In addition to Okinawan Karate, we offer Jujitsu and Kobujitsu (weapons) programs, and students can earn black belts in all three of the arts. I’ve achieved my Shodan, my first degree black belt, in Okinawan Kenpo. In our system, there are 10 levels of black belt. I will not achieve the top ranks because I started so late, but I can move forward. By returning to class following the test, I began my journey to Nidan, my second degree black belt. That’ll take a couple of years of finesse, focus and practice, but I’m looking forward to deeper study of this art! I’m also excited about returning to jujitsu. I used to go fairly regularly and earned my blue belt (the lowest rank in our system), but have not participated lately. To be honest, I’ve been rather clumsy recently, and the only way I should have been training in jujitsu was after being wrapped securely in bubble wrap! 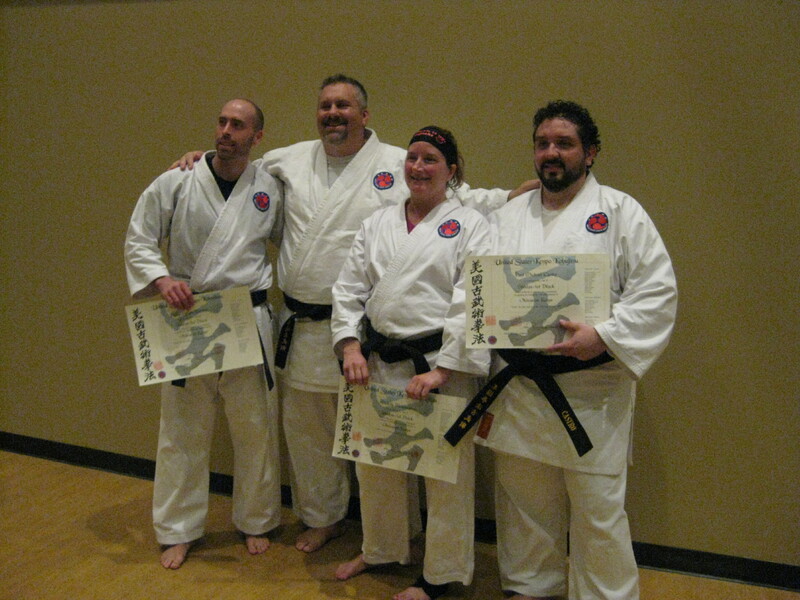 Now that our Shodan test has passed, I’m looking forward to once again hitting the mat (get it?) and working on those joint locks. One more thing I’m excited about is learning weapons!It took a while for me to become interested in them. Renshi Colahan said it would improve our open hand techniques and that was appealing to me, but I didn’t want to take on so much new material as I was closing in on the black belt test. I also didn’t know how I would fit it in, since the beginner class at the hombu is taught at the same time as our club classes. Lucky for us, Renshi has started teaching weapons once a week at the club, and I’m really excited about that. So far I’ve had a 30 minute class, and I’m hooked! I can’t wait to get out on the floor and learn some more! So now that I’ve earned my Shodan, is there more for me? Is there something to draw me back to the dojo? The answer is a resounding Yes! Not only do I have more to learn in Okinawan Kenpo, but I also have the opportunity to learn more jujitsu and discover the art of Kobujitsu (weapons). The opportunities may not be quite endless, but they are plentiful, and I’m excited to be moving forward – starting now! !